It's Friday morning at a Tim Hortons in downtown Toronto. The place is hopping with customers eager to get their caffeine fix. "There's nothing like that first sip," says Paul Stewart, starting in on his coffee topped with two creams and three sugars. "It gets the machine going." "Working with three kids all day, this is what I need," says nanny Sarah Russell as she relaxes with a coffee before work. Yes, Canada loves its coffee, more so than most other countries in the world. Out of 80 countries, Canada ranked No. 1 in 2015 when tallying up how many litres of coffee per capita we gulped down at food service joints like cafes. The country also scored third highest for the total amount of brewed coffee we consumed both inside and outside the home — an average of 152 litres per person. The statistics were compiled by global marketing research company, Euromonitor. 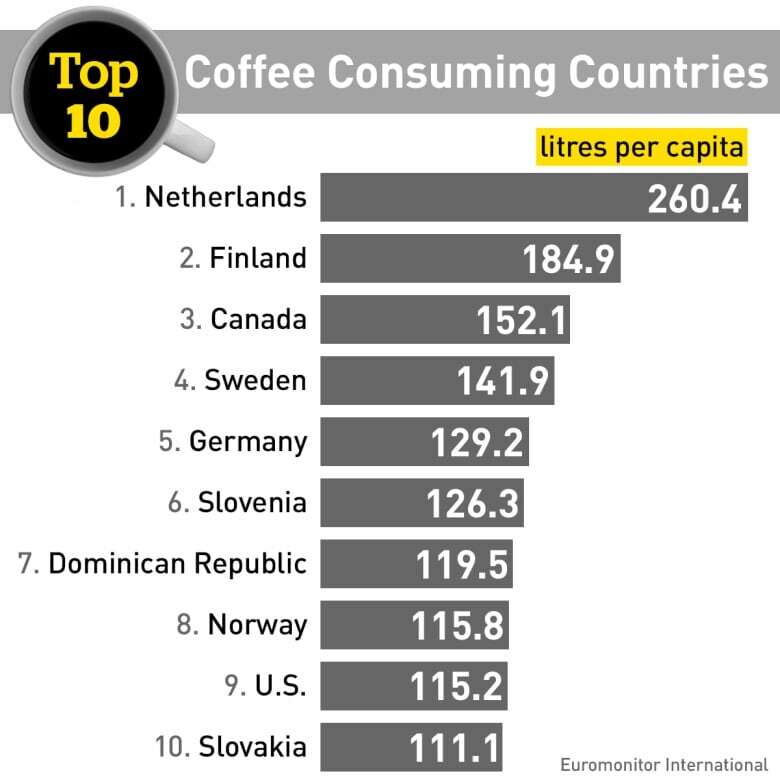 The only two countries that drank more java were the Netherlands, which took the No. 1 spot, and Finland, which came in second. Italy didn't make the Top 10. Euromonitor​ senior analyst Damiano Aureli attributes that in part to "the longstanding economic crisis," which means fewer Italians flocking to cafes. For total coffee consumption, Euromonitor combined the volume of coffee per capita that retail stores sold to consumers and that food service outlets purchased to brew. So what's driving Canada's coffee binge? Our long, cold winters are certainly a factor. "There's definitely a correlation between ambient weather and hot drinks consumption," says Euromonitor research analyst Mark Strobel. Although Stewart is enjoying a hot cup of Joe on a hot summer day, he agrees cold weather helps fuel his craving. "With the colder temperatures, long winters, what have you, waking up in the morning to a nice warm cup of coffee, oh my god, it's tranquility." In Euromonitor's coffee rankings, the U.S. took ninth place. Strobel, who is based in Chicago, notes that while some U.S. States endure cold winters, hot drinks aren't that popular in the warmer, southern regions. Instead, many people in America's south opt for soft drinks, says Robert Carter of Toronto-based market research company NPD Group. "You can tell an American in Canada when they have Diet Coke for breakfast." 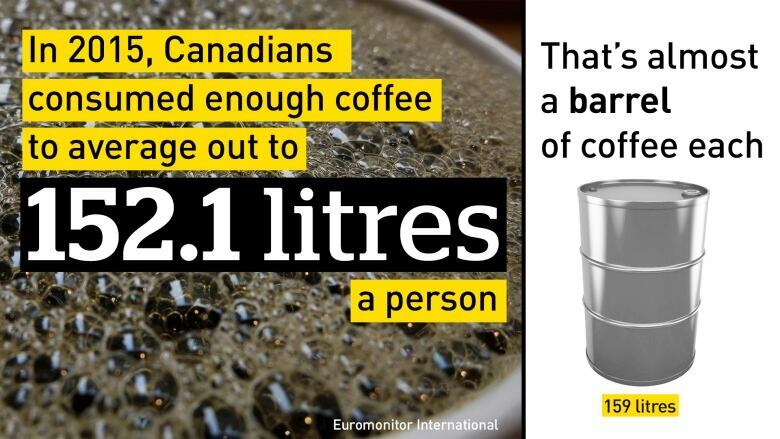 But cold weather isn't the only reason Canadians can't get enough coffee. Strobel says that java consumption at food service locations is what tips the scales in this country. "That's what's really pushing Canada to be a larger coffee market." Some of that can be attributed to the fact that Tim Hortons is found most everywhere in the country, says Strobel. The quick service restaurant is known in particular for its coffee and baked goods. There are currently 3,692 Tim Hortons locations across Canada. That's about one for every 9,000 Canadians. "There's no restaurant in the world that has that type of penetration," says NPD's Carter. 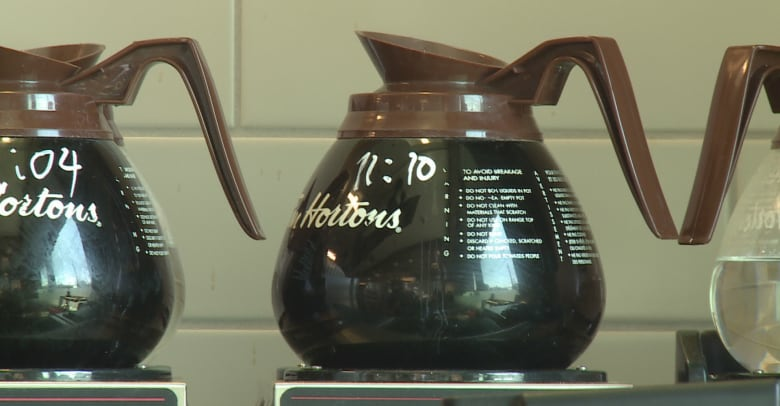 He adds that Tim Hortons has also become part of Canada's cultural identity. Former Canadian NHL hockey player Tim Horton opened the first location in Hamilton in 1964. The chain is now owned by Restaurant Brands International Inc., a multinational company that also owns Burger King. But people still view Tim Hortons as a Canadian tradition. "You see them everywhere" says Stewart. "We're programmed. It's in the blood." It's also a tradition that new Canadians pick up. Saroj Acharya says in his native country of Nepal everyone drank tea. But since he moved to Toronto a year ago, he has become hooked on coffee. 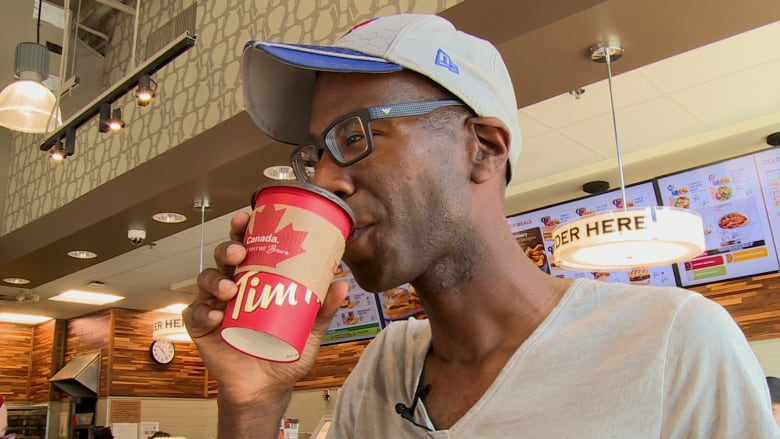 "When I came to Canada, I tried this Tim Hortons here. So it's very nice," says Acharya while enjoying his coffee at you know where. Of course, there are now many competitors vying for Canadians' coffee dollars. And that's helping ramp up the country's java addiction. "It's been growing quite strongly, says Strobel. In 2013, according to Euromonitor, Canada ranked No. 4 in the world when it came to coffee consumption. We edged up to No. 3 in 2014. Strobel says our coffee drinking has increased by a compound annual growth rate of 3.3 per cent between 2010 and 2015. He attributes the rise in part to the increasing popularity of single-serve coffee pods. They make home brewing more convenient. 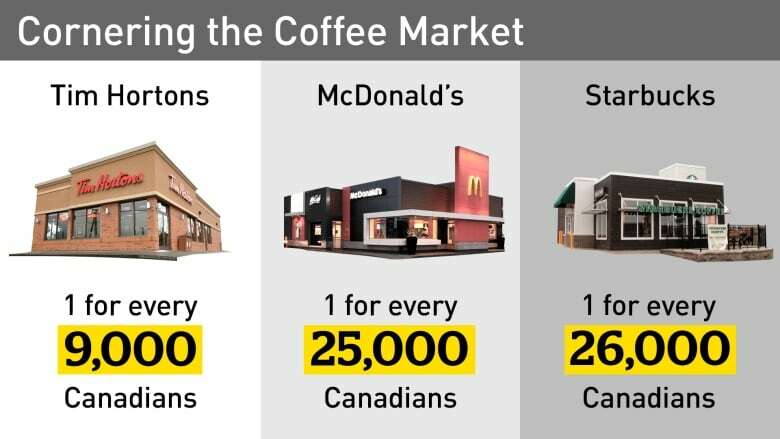 The pods, however, haven't cannibalized the coffee shop market, which continues to expand across Canada. McDonald's has been aggressively promoting its revamped coffee offerings. And Starbucks continues to grow its presence with now more than 1,000 locations across the country. Strobel also points out that Second Cup recently redesigned its stores, "trying to make it more of an experience" to attract coffee connoisseurs. So with temptation on practically every street corner, should Canadians worry about chugging too much coffee? The good news is the International Agency for Research on Cancer recently downgraded the drink as a possible cause of cancer — as long as it's not super hot — due to no conclusive evidence at this time. Plus, recent research studies have shown that drinking coffee may actually have health benefits such as lowering the risk of colon cancer. That's good news considering we're a country hooked on coffee. "It's the first thing I wake up in the morning and I think about," admits Stewart, finishing up his morning cup.